More ratings and reviews can be found in the Interactive Fiction Database. Augmented Fourth is a fairly easy puzzle romp whose appeal lies in wackily charming worldbuilding and sly jokes/reworkings of classic IF and fantasy tropes. It's well-crafted and polished (going to show, perhaps, that there's no reason an author's first-ever release can't be competently assembled) and I encountered no bugs. It did, however, have some irritating patches, mostly related to the design of the puzzles. Augmented Fourth uses an adapted-for-its-genre version of the Enchanter spellcasting concept: as a trumpeter you can play pieces whose magical power work transformations on your environment. And like the Enchanter spells, these pieces must be painstakingly acquired and learned (though, fortunately, Uri has dispensed with the irritating requirement that one learn them over and over again. Once you've learned a piece you know it; musicians are apparently less absentminded than magicians, as a rule.) This is a fun system in its basic concept, and one reason it has been reused so many times over the years, I imagine, is that it permits the author to put considerable freedom into the hands of the player. There are, of course, a couple of possible downsides. One is the combinatorial problem: you can trust that your players will try the spell in just about every conceivable situation, not only in the one or two places where it will solve a puzzle but in all the others, including several where it ought to cause major trouble. Uri does a good job of providing interesting failure messages where the spells are not going to work; he is also aided by the fact that the music-spells are not directable, so instead of having to implement an interaction (or failure) for every game object, he only has to deal with every location. This, I can only imagine, made things a lot simpler. The other downside is that the spells themselves do fairly odd and abstract things. This is delightful when it works; when it doesn't, one is often left wondering what's missing and whether one is even trying the right thing. In one sequence of the game in particular I was most of the way to the correct solution, but kept failing because I hadn't set things up quite properly. I had the idea; I just didn't have the execution exactly as Uri envisioned it, and there were no "you're almost right" messages to help me along, so I was left to wonder whether I had the right spell at all. Making this even more frustrating is that the spells fail randomly, especially during the early section of the game; you can easily 'misplay' a piece, not because it's not the right piece for the moment but because the random number generator is not on your side. This, boys and girls, is frustrating. I suppose the idea is to convey the feeling of accomplishment as the game goes on and you become a more proficient musician, able to play correctly the first time, but it also makes the early puzzles a pain. So much for that: there were a couple of spots where I was held up by what I felt was an arbitrary lack of hintage, and insufficient indication when I was close. There were also red herrings (besides the obvious one), some of them (to me at least) moderately confusing. On the whole, however, I didn't find this to be too severe a problem. The author provides an elegantly implemented walkthrough too, available from gmd, htmlized so that you can highlight only the parts you want to see. This is nice. This game also pointed up some spots in which my expectations have changed since early text adventure games. Augmented Fourth does some things the Old Skool way. The need to do arbitrary things just because they seem like they might be a good idea. The freedom to mistreat NPCs, which, these days, makes me feel a little guilty. The linearity of the game design, a lot of which consists of getting into one place which contains a key to another place where there's a key to a third place... Then, too, I nearly ran screaming when I encountered the, ah, maze. Not to worry, though: it's not as bad as it looks. And it all ends well: the endgame is satisfying and not too difficult, which is How It Should Be. There are moments of surrealism in the game, and plays on the names of things reminiscent of the un-un-machine, the T-remover, and other such mechanisms of text-only adventures. There is much talk these days of simulationist IF, of achieving "immersion" by getting the player to identify as strongly as possible with the PC; Augmented Fourth pursues a different direction, never trying to pull the player in but keeping much of the amusement value of the game precisely at that interface between player and player character. I think I derived as much amusement from the score notification system as I did from some of the puzzles. At the same time, there is a consistent story providing context for all this -- which the player also receives in an unimmersive way, by receiving flashes of what is happening "meanwhile" in another part of the kingdom. The result is stylish and entertaining, even if not emotionally compelling particularly; I never felt suspense or was particularly concerned about the jeopardy of my PC, for instance. But that was, in this case, fine. Where Augmented Fourth shines most is in the goofy style, which, with its numerous animals and brightly colored objects, frequently reminded me of a children's book. Combined with the relative easiness and the elegant implementation (which deals nicely with book objects and other tricky items), this makes it a pleasant way to spend a few hours. Augmented Fourth, a vastly entertaining effort, somewhere between fantasy and satire, about a trumpeter who falls out of favor with the obnoxious tyrannical king. Funny and charming. 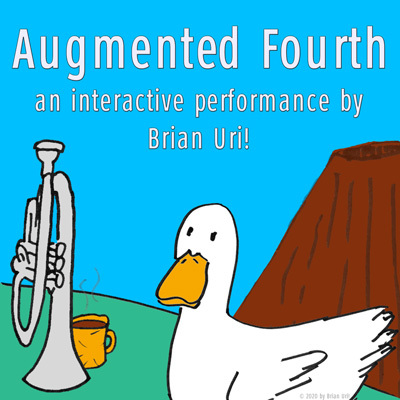 The IF archive is full of first-time efforts at authorship, many of them rather inglorious, so prospective players might not necessarily seize on Augmented Fourth, written by newcomer Brian Uri. Those who pass it by are missing out, though: this is one of the most imaginative and most polished games produced in quite some time, and it's a first effort in name only: the technical aspect is nearly flawless, and the story is remarkably well put together. It seems you're a below-average trumpeter who has been unfortunate enough to incur the wrath of your obnoxious (and astonishingly stupid) king, and the game opens with you being tossed into a pit. As with everything else in Augmented Fourth, however, even this unusual premise is crafted in ways you might not expect: you spend five moves simply falling into the pit, trying to grab onto things as you fall (and failing), and listening to the banter of a couple of nasty guards whose stupidity rivals the king's. Lest you think that all this heralds a conventional hero-struggles-against-injustice story, the author plays virtually everything in this scene for laughs, such as the guard's reading of your sentence: "This I hereby put to paper as my word is the law when the law is my word, when it is heard. Indeed. Thus I spake. Er, spoke. Alright, scribe, stop your dictating now." You eventually find an abandoned underground settlement of sorts, and meet one of its denizens, and the story that follows is consistently and entertainingly whimsical. The development of the plot, while competent, isn't quite as good as the writing; once you get past the intro and reach the main body of the game, you're essentially given a lot of puzzles to solve and an eventual goal to attain, and while it's a safe bet for experienced IF players that solving the puzzles will lead to reaching the goal, there's nothing to make the connection as such. To be sure, Augmented Fourth has a lot of company in that respect--not many games really integrate plot and puzzles more thoroughly than giving you an overall objective and perhaps an initial nudge--but it's still worth noting for those who crave a real melding of the narrative and the crossword. On the other hand, there's plenty of story that underlies the puzzles--i.e., the solutions to most of the puzzles rely at least in part on information specific to the game, so you won't get far without taking the time to read and understand the backstory. That reduces the sense that the game was an excuse for the puzzles, since the puzzles are specific to that game and wouldn't make sense in any other context. In short, while the progress of the plot isn't really related to the puzzles, the details of the story are, which certainly beats total independence of the two elements. Augmented Fourth does incorporate a device to reduce the sense that you've left the domain of plot and entered the realm of puzzles: periodically (in fact, at key points after you solve certain puzzles), you're shown cut scenes featuring the obnoxious king. The scenes are significant in several respects: they explain the premise of the game and give a basis for several important aspects of the setting, they develop the king's character (always worth a laugh), and they give your quest some context. To explain in detail would spoil the game, but suffice it to say that the cut-scenes turn your overall objective from saving your own skin to something more generally beneficial. It doesn't affect the puzzle-solving, but it does make the game feel more fleshed out. It's worth noting because, as most IFers know, giving a PC a set of motivations that explain every puzzle isn't easy; the cut-scene approach, which gives the PC's actions a temporal context (i.e., "meanwhile.") and, to some extent, an apparent link to other things that are going on. Technically, I suppose, it's not a perfect substitute, but it does create the illusion of involvement in the plot (as opposed to solving unrelated puzzles). At any rate, even if you don't buy the illusion, the cut-scenes are hilarious, which is a more than adequate justification for their presence. The puzzles themselves are creative, on the whole, and they revive something akin to Infocom's spellcasting system, with a few inventive (and amusing) twists. Chief among the benefits of this is the possibility of trying out your spells on various objects in various contexts, with accompanying potential for humor, and I'm pleased to report that the author left very few stones unturned in that respect. Moreover, not all the puzzles depend on the spells (nor do they apply the spells in straightforward ways), so solving puzzles isn't simply a matter of leafing through the spells to figure out which one applies, which sometimes happened in the Enchanter series. Some of the puzzles involve rather obscure intuitive leaps, and one relies on information that an NPC provides only randomly (meaning that you may not hear the relevant bit unless you wait around for a while), but on the whole they're both challenging and reasonably fair (and the author has uploaded a walkthrough to GMD). It's also nearly impossible to make the game unwinnable (though there are plenty of deaths)--the game goes out of its way to replenish finite resources and provide multiple opportunities to solve puzzles. Augmented Fourth doesn't transcend the limitations of the form or subvert the player's expectations in any fundamental way. Still, it's one of the best-written and best-programmed efforts to be released this year, and it's a good example of what you get when an author really goes overboard in providing funny responses for obscure actions and filling out the backstory. It's a polished, intelligent work that deserves your attention.